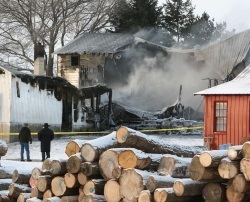 A few weeks ago, a fire broke out in a home in the Harmony Amish settlement, the largest in Minnesota. A bishop and his 18-year-old-son lost their lives. Since that time, both the local Amish community, as well as English neighbors (for anyone new, “English” is the term most, but not all, Amish use to refer to non-Amish people) have come together to help the remaining family, including the bishop’s widow and another son. Hundreds of Amish have stopped by the property since the Jan. 11 fire, but so, too, has a contractor with heavy machinery, bakers donating pies, visitors with donations of food and cash for the family, and others. It’s been a comforting reminder that the Amish and non-Amish communities can rely on each other when needed, said Bell. “There is an incredible exchange within southeastern Minnesota with the Amish. It’s really quite remarkable,” she said. “When we unloaded the food at the Amish home we were told how much it meant to them to have our community support,” said Bell. She asked what else the Amish would need. An Amish woman told her more bedding, so Bell asked friends and neighbors to help, and made a second delivery. Others donated food including hams, turkeys, a steer and pigs. A local contractor used equipment to clear debris, saving the Amish from having to do it by hand. “That part is understood, the people care,” Eli Hershberger said. “If there is a soft heart, it doesn’t take long to see it.” That is the other side of the loss, “that shows that there is a soft heart out there,” he said. He pointed to the hard, cold work firefighters from Canton, Mabel and Harmony did to put out the fire and find the bodies. The night was cold with a brutal wind chill that froze water on the ground, or on firefighting suits yet they were there and the Amish are thankful, he said. He also said Kaase was very caring and was at the funeral. Hershberger said he tries to help the English too. If there’s a fund at a local bank, he puts in money for someone who’s fighting cancer or some other need, he said. “Maybe we don’t reach out far enough,” he said. Last week Rebecca Miller shared an example of Amish aiding non-Amish disaster victims. Today’s story is an example of how aid can and does go the other way, with the Amish side graciously accepting the generous aid from outside their community. In the end I suppose it is simply what true neighbors do for one another–no matter the religion or culture one belongs to. Thanks for sharing this Gaylon. If I write a check, who do I make it out to? Hershberger Family? Please let me know. May God bless all who’ve helped them and I pray for the comfort of the Holy Spirit and that the surviving family members feel the presence of our Lord God and Savior Jesus Christ, especially in this difficult time. Amen! Yes make your check out to Hershberger Family and the bank will do the rest and thanks for your help this family needs all the help they can get. Thanks for sharing this information, including the links to the newspaper articles. It is good to know the non-Amish community is caring and sharing with the Hershbergers. I do not know the Hershberger family, but have driven by their place many times. Their farm is just up the road where an Amish woman,Lovina Miller, used to live and had a bulk food store where I’ve been many times. As a professional emergency response professional for 46 years I can only say that the International Building Codes are my life and it is important to obey them in housing construction. It is important to train all Amish young on Fire Safety. At my new College of Chemical Engineering in Missouri being built among the Amish we will stress proper construction. No amount of money can bring back the deceased. SAFETY FIRST. Natural Gas and electricity are equally dangerous. I am currently working with North Dakota on a boiler that catches on fire because of burning Wood Chips in a health club. Many childrens lives at stake. God Bless those that lost their lives. From what I’ve read in this site and others, education in fire safety isn’t going to work if the bishop decrees that smoke detectors are not permitted. It seems that some of the Amish don’t value life to the extent that others do, ascribing to the “Well, it was God’s will” reply. Was the lack of smoke detectors the reason the two couldn’t get out, or was it something else? Did something blow up, which wouldn’t have had anything to do with having or not having a smoke detector? I’d like to know ’cause, obviously, it makes a difference. Good to see help after a disaster works both ways in Amish territory. Not that I thought it wouldn’t! It’s proof that helping those who need help is the predominant human desire, despite the nastiness in today’s world. Makes one wonder about the rest of the world (ISIS, for example). ISIS is a prime example of the inherent good of the majority of the world’s Muslims. There are 1,600,000,000 Muslims in the world (that is 1.6 Billion) and only 50,000 adhere to the dangerous zealotry and vicious evil of ISIS. That is way less than even half of one percent of all Muslims. On the contrary – about 600,000 Christians slaughtered almost 2 million Muslims in the name of God during the Crusades. And tens of thousands of non-Christians were burned at the stake in the Spanish Inquisition – also in the name of God. Religion, sadly, has been used for evil purposes presently and throughout history. I don’t blame religion – I blame sociopathic zealotry. You’re right; lots of people who’ve claimed to know God and thought they’re doing Him a favor have done lots of things that were deplorable. This is what happens when men rely on their own opinions and prejudices to determine their deeds, instead of really asking God what HE wants done. This is not a forum for discussing the pros and cons of a belief system, but you need to realize the Amish are Christians and, like the colonists, have an ideology based on Judeo/Christian tenets. This is what sets them apart from the rest of the world. St. Paul reminds us that, as Christians, we’re not of this world though we are in it. Enough said. “Love never fails” is part of the Judeo/Christian faith. ISIS is NOT, nor ever will be, anything like it, because its ideology is based on a violent belief system that touts death to anyone who is not a follower of the same ideology. They do not believe that “God is Love” nor any other truth that comes from Christianity. This is where Christianity differs, as Christ said, “They shall know you because of your love for one another.” This is the faith the U.S. was founded on and the only way we will ever be a truly great nation. Caring for another, no matter what the person’s background, is a mark of someone who empties him/herself of self and cares more for the other person. This is what Christ taught and will continue to be our mark. Sure, there are non-Christians who are giving, and they’ve been taught that from a young age. I take nothing away from them for that is Godly behavior. I’m just pointing out the reason why ISIS will never be as we are, and that’s due to our Judeo/Christian foundation.